Dinoflagellate is any diverse flagellate protists comprising the taxon Dinoflagellata, or Pyrrophycophyta, typically characterized by being single-celled and with two dissimilar flagella during at least part of their life cycle. Among the dinoflagellates are both species exhibiting the characteristics of plants and those exhibiting characteristics of animals, with about half of them being photosynthetic autotrophs, while the balance are heterotrophs securing nutrients by acting as predators, endosymbionts, or parasites. Most dinoflagellates are marine plankton, but they are common in fresh water habitats as well. Their population distributions are correlated closely temperature, salinity, and depth. The photosynthetic dinoflagellates comprise the largest group of eukaryotic algae aside from the diatoms. Being primary producers dinoflagellates are an important part of the aquatic food chain. Some species, called zooxanthellae, are endosymbionts of marine animals and protozoa, and play an important part in the biology of coral reefs. Other dinoflagellates are colorless predators on other protozoa, and a few forms, such as Oodinium and Pfiesteria are parasitic. Massive blooms of dinoflagellates, often named "red tides" for the reddish color imparted by some species, can result in production of natural toxins, depletion of dissolved oxygen or other harmful impacts, including poisoning of humans who eat affected marine life In some cases, these blooms have been linked to increased nutrient loading from human activities. Dinoflagellates have variously been classified using both the International Code of Zoological Nomenclature and the International Code of Botanical Nomenclature (Olney 2002), with some listing this group as Phylum Dinoflagellata (UCMP), while others list it as the Division Pyrrophycophyta—the latter meaning literally meaning "fire plants" (Olney 2002). For example, the Integrated Taxonomic Information System (ITIS) places the dinoflagellates within the Kingdom Plantae as Division Pyrrophycophyta, while the taxonomy of Systema Naturae 2000 places them within Kingdom Protozoa as Phylum Dinoflagellata. Protists are a heterogeneous group of living organisms, comprising those eukaryotes that are not animals, plants, or fungi. In systems of biological classification, they usually are treated as the Kingdom Protista or Protoctista. Protists are more complex than bacteria in that they have cell nuclei, but less complex than fungi, plants, and animals because they are mostly single-celled, or if multi-celled, they lack highly specialized tissues. The protists are a paraphyletic group, rather than a natural (monophyletic) group, and do not have much in common besides a relatively simple organization. Some call protists the "left-overs" from the other eukaryotic kingdoms. Most dinoflagellates are unicellular forms with two dissimilar flagella. One of these extending toward the posterior is called the longitudinal flagellum, while, called the transverse flagellum, moves in a lateral circle around the equator of the organism. In many forms, these are set into grooves, called the sulcus and cingulum. The transverse flagellum provides most of the force propelling the cell, and often imparts to it a distinctive whirling motion, which is what gives the name dinoflagellate (from the Greek dinos for "whirling"). The longitudinal flagellum acts mainly as the steering wheel, but provides a small propulsive force as well. Dinoflagellates have a complex cell covering called an amphiesma, composed of flattened vesicles, called alveoli. In some forms, these support overlapping cellulose plates that make up a sort of armor called the theca. These come in various shapes and arrangements, depending on the species and sometimes the stage of the dinoflagellate. Fibrous extrusomes are also found in many forms. Together with various other structural and genetic details, this organization indicates a close relationship between the dinoflagellates, Apicomplexa, and ciliates, collectively referred to as the alveolates. The chloroplasts in most photosynthetic dinoflagellates are bound by three membranes—suggesting they were probably derived from some ingested algae—and contain chlorophylls a and c and either peridinin or fucoxanthin, as well as various other accessory pigments. However, a few have chloroplasts with different pigmentation and structure, some of which retain a nucleus. This suggests that chloroplasts were incorporated by several endosymbiotic events involving already colored or secondarily colorless forms. The discovery of plastids in Apicomplexa have led some to suggest they were inherited from an ancestor common to the two groups, but none of the more basal lines have them. All the same, the dinoflagellate still comprises the more common cellular organelles, such as rough and smooth endoplasmic reticulum, Golgi apparatus, mitochondria, and food vacuoles (Olney 2002). Some have even been found with a light sensitive organelle such as the eyespot or a larger nucleus containing a prominent nucleolus. Dinoflagellates have a peculiar form of nucleus, called a dinokaryon, in which the chromosomes are attached to the nuclear membrane. These lack histones and remain condensed throughout interphase rather than just during mitosis, which is closed and involves a unique external spindle. This sort of nucleus was once considered to be an intermediate between the nucleoid region of prokaryotes and the true nuclei of eukaryotes, and so were termed mesokaryotic, but now are considered advanced rather than primitive traits. In most dinoflagellates, the nucleus is dinokaryotic throughout the entire life cycle. They are usually haploid, and reproduce primarily through fission, but sexual reproduction also occurs. 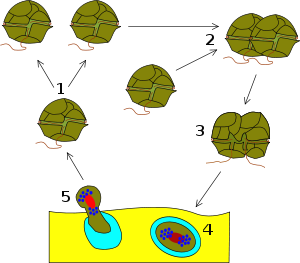 This takes place by fusion of two individuals to form a zygote, which may remain mobile in typical dinoflagellate fashion or may form a resting dinocyst, which later undergoes meiosis to produce new haploid cells. However, when conditions become unfavorable, usually when nutrients become depleted or there is insufficient light, some dinoflagellate species alter their life cycle dramatically. Two vegetative cells will fuse together forming a planozygote. Next, there is a stage not much different from hibernation called hypnozygote when the organism takes in excess fat and oil. At the same time, its shape is getting fatter and the shell gets harder. Sometimes even spikes are formed. When the weather allows it, these dinoflagellates break out of their shell and are in a temporary stage, planomeiocyte, when they quickly reform their individual thecae and return to being dinoflagellates like they were at the beginning of the process. Image of bioluminescent red tide event of 2005 at a beach in Carlsbad California showing brilliantly glowing crashing waves containing billions of Lingulodinium polyedrum dinoflagellates. The phenomenon is thought to have something to do with quorum sensing. Dinoflagellates sometimes bloom in concentrations of more than a million cells per milliliter. Some species produce neurotoxins, which in such quantities kill fish and accumulate in filter feeders such as shellfish, which in turn may pass them on to people who eat them. This phenomenon, which is more generally known as "harmful algal bloom" (HAB), is often called a red tide, from the color the bloom imparts to the water. One type of algal bloom known as red tide is caused in the eastern Gulf of Mexico by a species of dinoflagellate known as Karenia brevis, with the bloom appearing off the coast of Florida almost annually and often discoloring the water a deep reddish-brown hue. "Red tide" also is commonly used to describe harmful algal blooms on the northern east coast of the United States, particularly in the Gulf of Maine. This type of bloom is caused by another species of dinoflagellate known as Alexandrium fundyense. Red tides (and algal blooms in general) may be produced when dinoflagellates are able to reproduce rapidly and copiously on account of abundant nutrients in the water, whether from human inputs or natural upwellings. Although the resulting red waves are a miraculous sight, the toxins not only affect marine life but can impact the people who consume marine life. This can introduce both non-fatal and fatal illnesses. Karenia brevis produces the potent neurotoxin called brevetoxin. Another poison, produced by Alexandrium fundyense, is saxitoxin. Human inputs of phosphate further encourage these red tides, and consequently there is a strong interest from both medical and economic perspectives in learning more about dinoflagellates, . However, some colorless dinoflagellates, such as Pfiesteria, may also form toxic blooms. And it should be noted that not all dinoflagellate blooms are dangerous. Dinoflagellate cysts are found as microfossils from the Triassic period, and form a major part of the organic-walled marine microflora from the middle Jurassic, through the Cretaceous and Cenozoic, to the present day. Because some species are adapted to different surface water conditions, these fossils from sediments can be used to reconstruct past surface ocean conditions (Sluijs et al. 2005). Arpylorus, from the Silurian of North Africa was at one time considered to be a dinoflagellate cyst, but this palynomorph is now considered to be part of the microfauna (Arthropoda). It is possible that some of the Paleozoic acritarchs also represent dinoflagellates. In 1753, the first modern dinoflagellates were described by Baker and they were named by Muller in 1773. The term derives from the Greek word δῖνος (dinos), meaning "whirling," and Latin flagellum, a diminutive term for a whip or scourge. These same dinoflagellates were first defined by Otto Bütschli in 1885 as the flagellate order dinoflagellida. Botanists treated them as a division of algae, named Pyrrhophyta ("fire algae"; Greek pyrrhos, fire) after the bioluminscent forms, or Dinophyta. At various times the cryptomonads, ebriids, and ellobiopsids have been included here, but only the last are now considered close relatives. Dinoflagellates have a known ability to evolve from non-cyst to cyst forming strategies, which makes it nearly impossible to recreate their evolutionary history. Faust, M. A., and R. A. Gulledge. 2002. Identifying harmful marine dinoflagellates Smithsonian Institution Contributions from the United States National Herbarium 42: 1-144. Retrieved June 6, 2008. Hoek, C. van den, D. G. Mann, and H. M. Jahns. 1995. Algae: An Introduction to Phycology. Cambridge, UK: Cambridge University Press. ISBN 0521304199. Integrated Taxonomic Information System (ITIS). n.d. Pyrrophycophyta ITIS Taxonomic Serial No. : 9873. Retrieved June 6, 2008. Olney, M. 2002. Dinoflagellates Microfossil Image Recovery and Circulation for Learning and Education (MIRACLE), University College London (UCL), Micropalaeontology Unit. Retrieved June 5, 2008. Rapport, J. 1996. Dinoflagellate habitat, ecology, and behavior. Dinoflagellate factories: The dino life history Monterey Bay Aquarium Research Institute. Retrieved June 6, 2008. Sluijs, A., J. Pross, and H. Brinkhuis. 2005. From greenhouse to icehouse: Organic-walled dinoflagellate cysts as paleoenvironmental indicators in the Paleogene Earth-Science Reviews 68(3-4): 281-315. Systema Naturae 2000. 2007. Phylum Dinoflagellata Systema Naturae 2000'. Retrieved June 6, 2008. University of California Museum of Paleontology (UCMP). n.d. Dinoflagellata University of California Museum of Paleontology. Retrieved June 6, 2008.